Rose gold bangle bracelet is made of 100% pure natural solid silicone rubber and pressed by hydraulic press. The wrist strap itself has a certain degree of tension and softness, so it is easily deformed and immediately restored. The silicone bracelet has no side effects on the human body and does not irritate the skin. Rose gold bangle bracelet is made of 100% pure natural solid silicone rubber and pressed by hydraulic press. The wrist strap itself has a certain degree of tension and softness, so it is easily deformed and immediately restored. 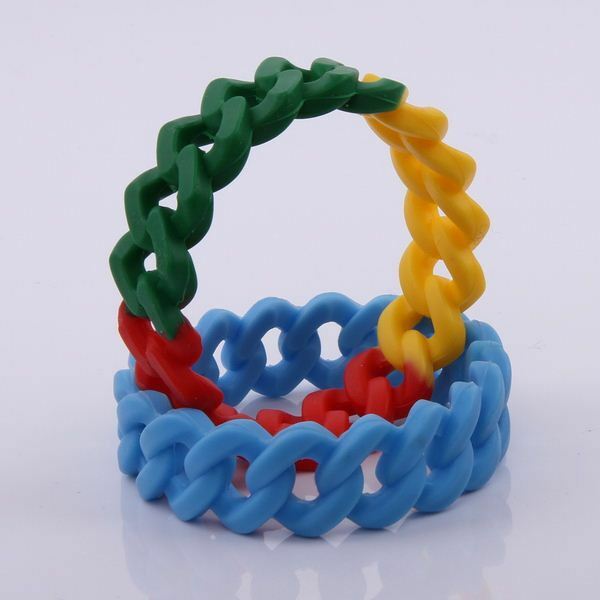 The silicone bracelet has no side effects on the human body and does not irritate the skin. It is a true green environmental protection accessory. Rose gold bangle bracele has the characteristics of softness, no deformation, no toxicity, no abrasion, no cracking, high temperature resistance, long service life, no irritating skin and fashion. It can be used in various casinos, sports fields, as gifts, souvenirs, promotional items, etc. It is a hot and fashionable accessory; it is also a low-cost, high-advertising advertising promotional gift. Adding companies and corporate LOGOs are more prominent, closer to people's lives, and play a very good publicity effect.